Islay is famed for its distinctive whiskies, and is home to eight working distilleries. Known as the Queen of the Hebrides, Islay is fertile and its hills - though rugged - are small. Amongst outdoor enthusiasts, the island is perhaps best known amongst birdwatchers, being a wintering ground for a huge population of geese, as well as a breeding ground for rare corncrakes and chough. However, Islay offers some superb scenery for walkers. There are spectacular beaches of perfect fine sand, whether the vast sweep of Machir Bay or the wide sands of Loch Gruinart, or a score of more intimate, sheltered coves around the Rhinns. In the southwest, the Oa peninsula offers spectacular coastal cliffs as well as a rugged interior. There are fine woods around Bridgend and Ballygrant, picturesque white-washed villages such as Port Charlotte or Port Ellen, and superb views over the sea seemingly around every corner. With some wild corners receiving few visitors, Islay has something for everyone who enjoys exploring on foot. Three Distilleries walk, from Port Ellen 6.25km 2 hours - 1 day! 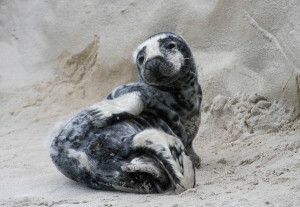 Ben Dolphin finds an apparently abandoned seal pup on an Islay beach - and finds out what to do. "As both a wildlife enthusiast and snap-happy photographer I confess I have an innate desire of wanting to get as close to wildlife as possible. Or more accurately, as close as wildlife will allow me to get..."
Want to advertise your business on this page?